It is good for me that I have been afflicted, that I may learn Your statutes…I know, O Lord, that Your ordinances are just, and in Your faithfulness You have afflicted me. My son, neglect not the discipline of the Lord, neither be thou weary when thou arty rebuked by Him.For whom the Lord loves, He chastises; and he scourges every son whom He receives. Time passes and here we are at the beginning of the sacred season of Lent! Well, giving up chocolate is a good start! And you will recall reading or hearing about the three ways of doing penance: fasting, prayer, alms-giving. (See Devotions page for Lent, past Newsletters). These holy practices are important and salutary, as Our Lord Jesus Himself instructs us (St. Matthew 6:1-18). In making use of these practices, it is essential that we have a plan for Lent, some sort of program for ourselves, for without that, we enter Lent as on uncharted waters, floating aimlessly. We should prepare with careful soul searching and a good examination of conscience, focusing especially on the dominant fault/faults of our character, our most frequently committed sins – where we fail God most often. With this good beginning, we can make a pact with the good Lord that we will strive generously to be truly good and no longer offend Him in these ways. And we will achieve, with the help of His grace, the soul-renewal that Lent is meant to be for us. But however secret, holy and well-intentioned our own efforts may be, there is another aspect of penance that entails the unplanned and the unexpected. This side of penance is very often not recognized, and as a result, neglected – and even refused. Yes, another whole world of penitential offerings awaiting our consideration and wholehearted acceptance. This side of Lenten penance holds special riches and graces. 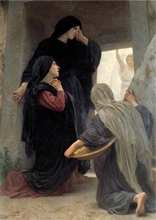 The “What should I do?” reminds us of the story in the Gospel about the rich young man who asked Jesus the very same thing: “What should I do – to gain eternal life?” Our Lord’s unexpected answer stunned him: “If thou wilt be perfect, go, sell what thou hast, and give to the poor and thou shalt have treasure in heaven; and come, follow Me” (Mt. 19:16–30). The question also reminds us of an incident in the life of St. Therese. A novice, bewailing her faults to her young novice mistress, said, “Oh, how much I must acquire to become a saint!” And St. Therese’s immediate and incisive reply was, “Say not ‘acquire,’ but rather, lose and get rid of’!” Both tell of emptying oneself – just as Our Lord gave as an example (Phil. 2:5-7). So maybe penance is actually more than DOING SOMETHING? Yes, indeed – more than our own planned and decided-upon offerings. For outside of our own plans, there is God’s plan: His Providential arrangement for each soul, in all that He sends in the way of pain, inconvenience, annoyance, misunderstanding, disappointment, frustration, regret – troubles and problems of all kinds. Rather than active suffering, these afflictions require more passive suffering. That word, “passive” should remind us of the Passion of Christ. Passive, passion, patience – all of these words have their derivation in the Latin word, pati – to suffer, to endure. And if your knowledge of the spiritual life brings to mind the phrase, “passive purification of the soul,” yes, these are the stuff of which that purifying Dark Night is made! Nothing so grand and dramatic as is sometimes construed; just the very humbling, truly humiliating; the awkward, complicated and difficult things of life… afflictions plain and simple. 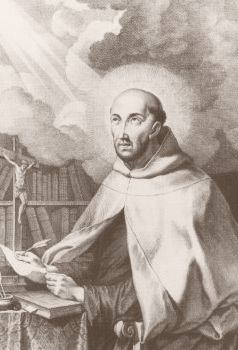 One of the lesser known works of St. John of the Cross is called The Precautions. 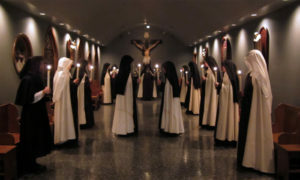 It waswritten for nuns personally influenced by St. Teresa of Avila, who were ardent in their embrace of the spiritual journey. St. John offers warnings and instructions for the conquering of the three spiritual enemies each soul faces in the service of God and pursuit of sanctity: the world, the devil, and oneself. The particular “precaution” we give here addresses the concept of more passive penance. … Understand that you have come to the monastery so that all may fashion you and try you. Thus, to free yourself from the imperfections and disturbances that can be provoked by the mannerisms and attitudes of the religious, and to draw profit from every occurrence, you should think that all in the community are artisans — as indeed they are — present there in order to prove you; that some will fashion you with words, others by deeds, and others with thoughts against you; and that in all this you must be submissive as is the statue to the craftsman who molds it, to the artist who paints it, and to the gilder who embellishes it. If you fail to observe this precaution, you will not know how to overcome your sensuality and feelings, nor will you get along well in the community with the religious, or attain holy peace, or free yourself from many stumbling blocks and evils. The Precautions, in various contexts, were the very same counsels St. John gave to all of the souls he so willingly directed – men and women, inside or outside the cloister, young and old, good and bad. 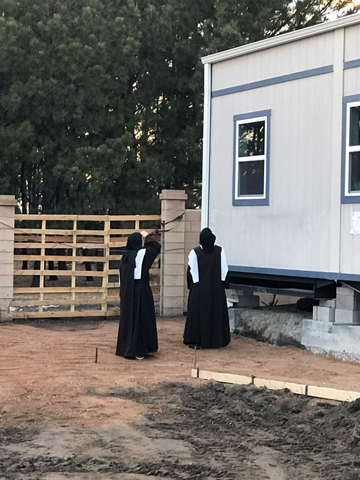 The Precautions form part of our Novitiate studies, and of course, we frequently re-read the works of Our Holy Father St. John throughout our Carmelite life. When young novices – or anyone, for that matter – first read St. John’s candid statements, they find themselves very enlightened, indeed! And challenged. The important lesson is that people – and events, too – will crop up to chisel you! Your preferences and your agenda will meet with resistance, opposition, or even hostility! Or, you might be faced with health troubles, chronic and debilitating – in yourself or loved ones. Or maybe you will suffer the loss of a friend or family member. A project or plan which has required all your talent and energy has failed and fallen apart… And when anguish leads us to the very natural impulse to cry out, “Why?” faith must enter in with the assurance: it is God who does this. Yes, our loving God, like a sculptor with hammer and chisel – carefully, devotedly, relentlessly – chisels and chips away at us. The design He has in mind for our soul is quite different from what we have made of it, and He must remove our faults, our wretched tendencies, our pride, sloth and all the rest – the obstacles that keep us lagging behind on our journey to heaven. He must detachus from the world, from its standards for success, from ourselves. But make no mistake – it is not only other people and events that make us suffer. 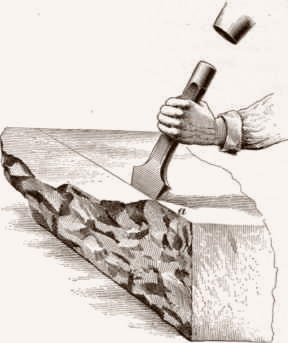 Probably the most mortifying truth for us to face is that we ourselves do our plentiful share of chiseling! Perhaps without intending to… or maybe sometimes with a little malice – we annoy, irritate, upset and crucify our neighbor. Memorable incidents throughout our years in Carmel always bring smiles – and the same beautiful lesson. A Community of Sisters all of one mind and one goal is a great gift, for as Psalm 132 sings, “Behold how good it is, and how pleasant, where brethren dwell at one!” But unity of mind and heart doesn’t remove the human reality of differences in personality, character, outlook, and methods of accomplishing. So Community life, as is true for everyone in families or close-working groups of people, can sometimes bring about those times of friction, along with the opportunity for patience and indulgence. God wills it to be this way, of course, to purify and fashion unto His Own likeness everyone here. But now and again, a good-humored, well-aimed, “Sister, you’re chiselin’ me!” – is not out of place! Continuing our study of detachment, we note that of course we cause trouble to ourselves, and often it is hardest of all to have patience with our own failures, mistakes, missteps. But here is where humble detachment reaches its most piercing, intense emptying, as well as fruitfulness. When we appreciate that we are on the “wrong” side of personality clashes, that our stubborn pride has created the tension; that we have failed in charity, and no one else really can be blamed… When we cannot, and no longer want, to escape the sad disarray of our soul – then we know the beginning of peace and healing through our humble admission and confession of the truth. True meekness and humility always bring peace. It is the meaning of the Beatitudes: “Blessed are the poor in spirit, for theirs is the kingdom of Heaven, Blessed are the meek; they shall possess the earth” (Mt. 5:3-4). God gives the riches of His mercy to the truly poor – those who feel and truly know their need of Him, who depend only upon Him to support and raise them from their misery. To these He gives a certain dominion over evil, over themselves, over all that works against God’s work in them. We all know that this whole sorry landscape is just what life is made up of during our exile and pilgrimage on earth! St. Therese called it all the “daily pinpricks” of life. But we know, too, that our Divine Savior came to earth just because of this lamentable state of affairs, “not for the just, but for sinners; not for the healthy, but for the sick” (cf. Mt. 9:12-13). He loves us too much to leave us in our misery. We are the object of His merciful love, His merciful, expert intervention – through trial, interior and exterior. The Divine Artist, the Divine Surgeon is at work! And Lent is all about stepping aside from our regular life into the silence of our own souls, where God dwells; “giving up” certain things, certain comforts and entertainments, to dwell with Him. 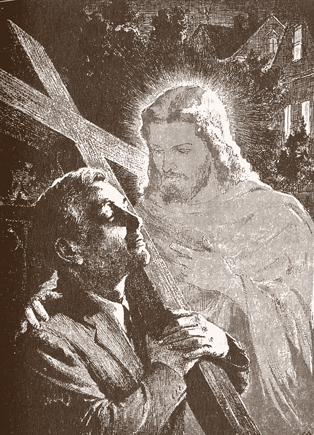 As Father Osende so wisely reminds us, “All our good consists in being near Him, and if our miseries take us to Him, then blessed are they, for they take us to our ultimate end and true good.” Let us not forget to ask help in our efforts from the great Mother of the poor – Health of the sick, Refuge of sinners, Comforter of the afflicted, Help of Christians, Queen of peace, pray for us! This special crucifix was formulated to assist the souls of the dying. It joins two sacramentals favored by Popes with a plenary indulgence at the hour of death – the Crucifix and the St. Benedict Medal. What has come to be known as the Happy Death Crucifix carries a St. Benedict’s Medal at the center. As we discussed in a previous newsletter, the St. Benedict Medal is the only medal blessed by the Church with special exorcisms, and is therefore uniquely powerful against the devil. This is, perhaps, why the St. Benedict Crucifix is the favored crucifix to be used by exorcists, and we all know that temptations from the devil are most virulent at the time of death – the last effort of Satan to seize a soul. This crucifix seems to have as its history the peaceful and happy death of the great St. Benedict himself. 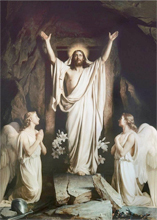 He died standing at the foot of an altar with his hands raised towards heaven. He had just received the Body and Blood of Jesus Christ and he thus united his death to that of Our Lord on Calvary, of which the Eucharist is the memorial. 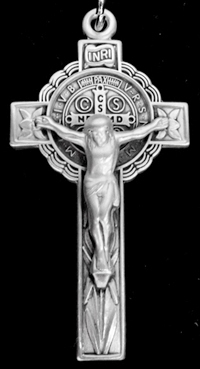 So, the Medal of St. Benedict placed near Christ on the cross reminds us of his glorious death. Moreover, this saint is invoked as one of the patrons of a happy death. It is told of him that appearing one day to St. Gertrude, he gave this message: “Whoever reminds me of the dignity with which Our Lord chose to honor and bless me in giving me so glorious a death, I will help him faithfully at the hour of his death and I will oppose all of the enemy’s attacks upon him. Protected by my presence, he will be secure despite the snares of the tempter and will joyfully soar up to eternal happiness” (The Herald of Divine Love, Vol. 2, Ch. 9). New Vexilla Regis two-tone ebony inlaid St. Benedict Crucifix – made the same way as the original from Bancel in France! 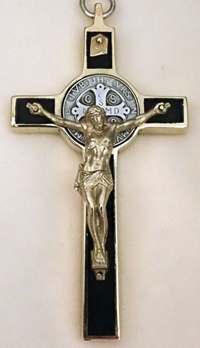 Since 2003 and the humble beginnings of our website gift shop, the various designs for the St. Benedict Medal Crucifix have multiplied, including the recasting of early elegant designs (called “dies”) by family-owned Catholic manufacturers in the eastern United States, as well as Europe. It has been wonderful to witness a return to beautiful religious art in sterling silver and pewter crucifixes and medals, and we are so pleased to offer many of these beautiful traditional designs, very often chosen for rosaries. Just recently we added pewter versions of two of our favorites – the Engraved St. Benedict Crucifix and the Lily St. Benedict Crucifix. All the Sisters marveled at the incredible detail the manufacturers were able to put into these new pewter (lead free) pieces – sturdy, beautiful, and very affordable! Of course, our local foundry, Vexilla Regis (perhaps some of you remember the story of its beginnings from a previous newsletter), continues to grow, producing the wood inlaid St. Benedict Medal Crucifix that was manufactured for more than 100 years by Bancel Manufacturing in France. 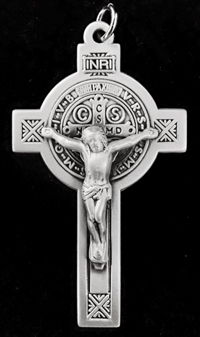 We have a limited supply of the new two-tone design available, and if you would like to sign up for a notification when more of these, as well as the nickel silver crucifixes, are back in stock, you may do so here. Having at least one book as a companion during Lent is so important for keeping to your plan and resolutions for these holy days. Whether you choose books for meditation or for spiritual guidance, you will have a constant source of encouragement and support. Nothing so helps one forget oneself as delving into the truths given in a worthy spiritual book. You will surely gain knowledge of Christ and the Gospel, guidance for your spiritual path, and grow in love and gratitude for all that Our Savior endured to redeem us. 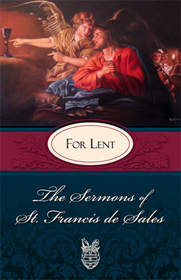 We have been gratified to see so many of you already ordering your Lenten spiritual reading during these past weeks. Among the books we offer on our website, we might suggest a few. 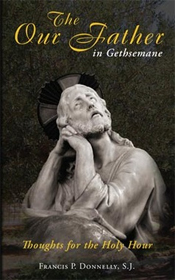 A little devotional book called The Our Father in Gethsemane presents the beloved Lord’s Prayer in view of His Passion. In his meditative text, Father Donnelly makes use of Scripture, liturgical hymns and poetry, brief counsels and beautiful, short prayers that conclude most chapters. 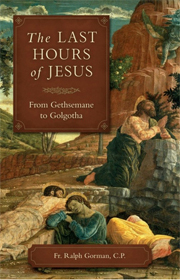 The expression of the Heart of Jesus during His Passion is in this beautiful book! The Sermons of St. Francis de Sales for Lent hold treasures for contemplating the sufferings of Our Lord. This greatest of spiritual directors teaches and tenderly urges souls to behold well the virtues of Christ – and then imitate them! A wise counsel opens the book: “My advice is that henceforth we live no more in ourselves, but that in heart, intention and confidence we lodge forever in the pierced side of the Savior.” The spirit of this advice fills his holy sermons. 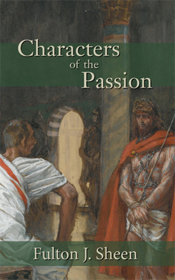 Characters of the Passion is also a rather slender book, but filled with insightful meditations from Archbishop Sheen considering the individuals that witnessed the sufferings of Christ. Ever at the ready to teach our Holy Faith, Fulton Sheen offers penetrating reflections that challenge, enlighten and encourage. 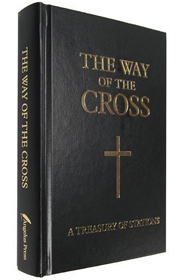 The Way of the Cross: a Treasury of Stations is now published in a fine quality hardbound format, which allows for frequent use. This book gives thirteen methods for meditating the Stations of the Cross of our Lord and is a valuable companion for Lent. Remember, even if you cannot attend Stations in a public chapel, a book like this allows you to contemplate the Passion of the Lord anytime, in the silence and solitude of your own Lenten quiet. Lastly, we offer what will probably be our final Cross & Crown title: Pathways to Personal Peace. The whole ambiance of this book is peace. Msgr. William Doty writes with deep understanding of the human heart, the book being “permeated with Christian optimism and hope.” His counsels for finding peace are made in the light of faith and for the striving to imitate the virtues of Christ Our Lord. Of special attention for Lent would be the chapters, “The Road of Obedience,” “The Peace of Solitude,” and “Peace Through Repentance.” But the entire book, instructing on the peace “not of this world” is wonderful reading for this holy season. 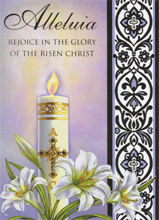 Easter cards, though not as commonly sent as Christmas cards, are really gaining in esteem. 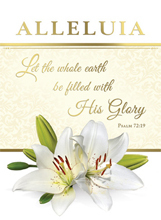 We have found such touchingly beautiful cards to commemorate and celebrate this central event of Christian faith. For ourselves, we must say that after the dramatic and sorrowful days of Passiontide and Holy Week, the triumphant message of Our Savior’s glorious victory over death, brings much joy in greetings from our families and friends. First Holy Communion gifts are not always easy to find. Among the gift possibilities, of course, is a special, perhaps custom-designed, First Communion rosary. But other gifts include commemorative plaques, rosary boxes or framed religious prints. 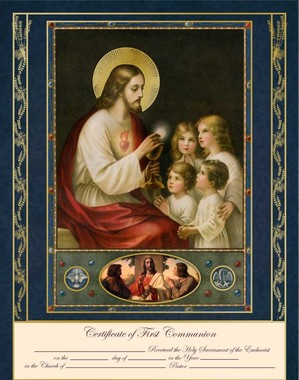 New this year are the First Communion commemorative certificates, both framed and unframed. Beautifully printed, they can be a treasured remembrance of that most important day – for the whole family and for the little one, or anyone, receiving for the first time. It is rather embarrassing now, how many times we have announced the new website and promised that it would be “Coming soon to a computer near you!” “Soon” has proved to be a somewhat relative term. As we kept coming up with more things that needed to be done, the date for launch kept getting pushed back. Details are so very important in all of this! Both our excellent programmers and the Sisters have worked diligently to iron out every last one. We are wrapping up those final details and will be applying the new template within the next couple of weeks. Our plan is to let you know when it finally does happen! Just to review what we have mentioned in the last few Newsletters about all of this, we have done no maintenance or updates of any kind since the launch of our last template in 2014. So it is no small wonder that we are receiving more and more emails with complaints about outdated/broken functionality. Technology marches on – and mercilessly so – and we have had to learn this in a big way. Buttons don’t work, pages can’t be viewed … and cell phones? Trying to browse our current website with a cell phone is more and more proving to be an exercise in frustration. And at this point in history, we would never try to convince people to give up cell phones (though we would really like to try – for their own good)! We knew the time had come to do something. As we have mentioned before, the new site will look very different. Different, but improved, we hope … with a focus on mobile usability. Our “IT-Sister” was explaining to us a function of the new site, saying, “And the good part is that it is now ‘responsive’.” We all gave her a blank look and politely waited for further explanation. But she just continued by groaning, “…and oh, how weary I have grown of that word!” No, we still don’t understand the world of cell phones and doubt we ever will. But we now know that “responsive” is important, and responsive is what will make our site so much more easy for you to use. So even if (perhaps) neither you nor we know all the details about what “responsive” is and what it entails, it is what we both want. Some of the changes have already taken effect. If you clicked on the link to view this email in your browser, you will have noticed that our Newsletter Archive has found a completely new home and format, on an entirely different website. Although it still closely links to our current site, the new format will be easier for us to arrange, organize and control, and we hope much easier for you to use, with the advantage of categories and tabs. And best of all, and once again, the Newsletters will now be (ahem) … responsive. We were also able to restore many of the photos in our older newsletters that were lost in the last transfer, which gives to readers a better knowledge of the history and progress of our Carmel. Photos of Clothing and Profession ceremonies, as well as of our last building project in 2004, will give depth and added interest to the archives. You’ll see how our enclosure appeared in our early years – with the young, small trees and not much shade! In our last Newsletter, we told you about our latest building project for our larger workspaces. The project is now nearly completed. 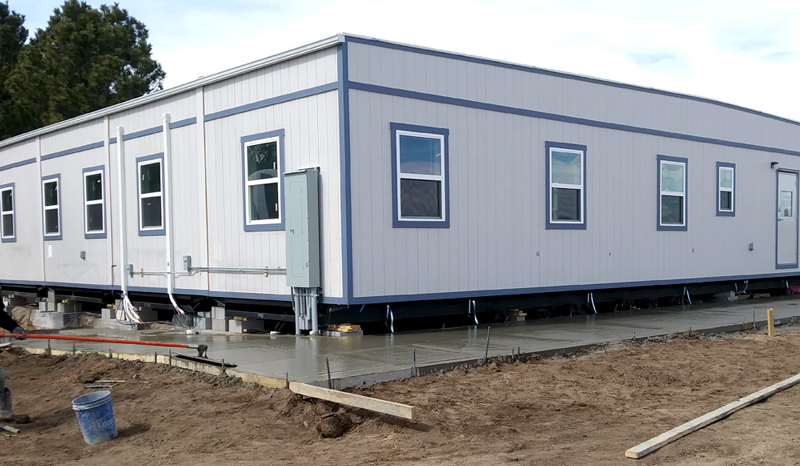 Such is the world of pre-fab building – one day there is no building, and a couple of hours later, it is very present. 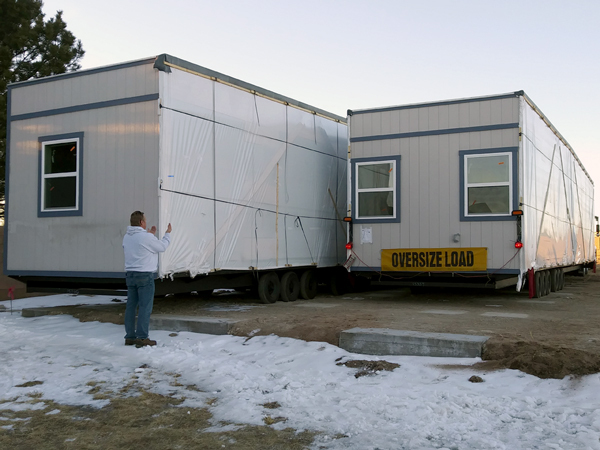 The modular sections, four of them, arrived on the last day of January, and it made quite the production out there on our little side road. 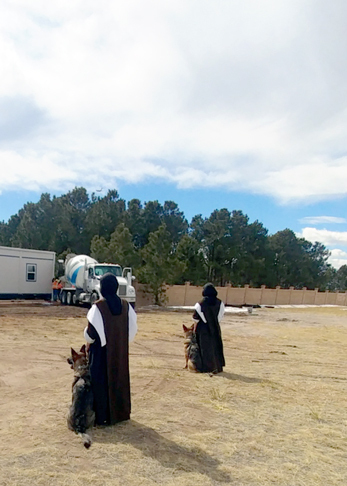 All of these double-wides attached to idling semi-trucks, lined up down the road… We wondered – and never did hear – what the neighbors thought! In any case, we were pretty excited finally to see them after almost two years of planning. When all the men and trucks had gone, we went outside, climbed up ladders, and peeked through the windows to see what we could of the new building – if outlets, switches, walls, and cabinets looked the way we planned. Very unfinished it was, but things seemed to be in place, and knowing that, we ended peacefully that rather tiring but happy day. 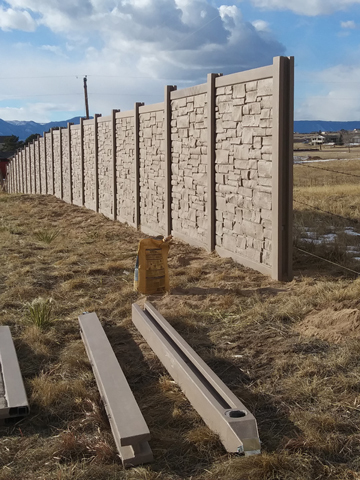 It has taken about a month to do the hook-ups for electrical power and plumbing, as well as finalize the ground work providing for drainage of rain and snow, etc. Needless to say for this time of year, we had a few setbacks due to winter weather. But God granted us two weeks of temperatures in the 40s and 50s, warm enough long enough for the ground to thaw, the final groundwork to be done, and concrete to be poured for the sidewalks around the building. The building should finally be ready for its Carmelite occupants around the Feast of St. Joseph. 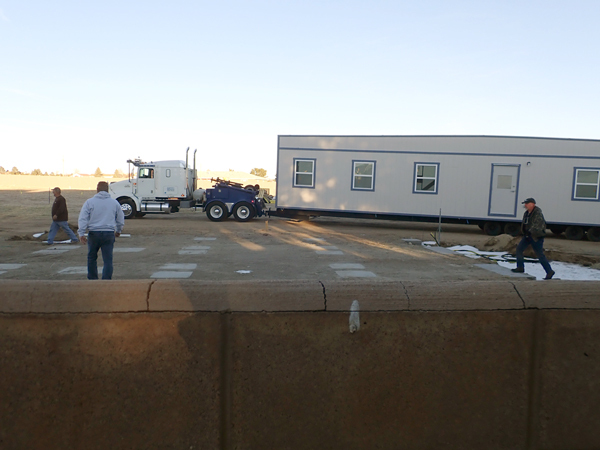 The first section of the new building arrives. The new building was placed right outside our enclosure wall. The four sections of the building were parked next to each other. Over the next week, work crews came out to join the sections with special precision equipment. The weather warmed up just long enough to pour the cement for the sidewalk going around the new building. Our plan is to landscape the area this spring and summer with a variety of trees, hardy shrubs and perennials. 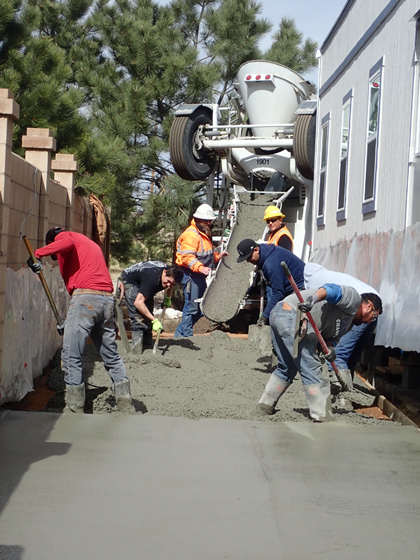 The men worked hard to pour the cement while the weather was warm. Despite a sunny forecast, we still had a brief 10-minute snowstorm that day! We were grateful it did not halt the work or harm the concrete. Each day, when the workers were gone, we came out to check the work done on the new building. Here, you can see that we removed one section out of our enclosure wall, which will be replaced with a gate leading from the old part of the enclosure into the new. 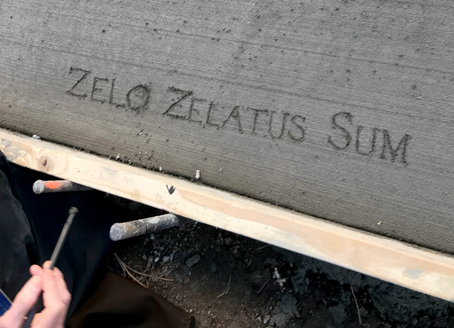 We carved the first words of the Carmelite motto, “With zeal I have been zealous,” into the still-wet cement of the gateway leading into the new building. The new enclosure wall, as it was being constructed. The fine gentleman who did this work was meticulous, with measurements, etc. 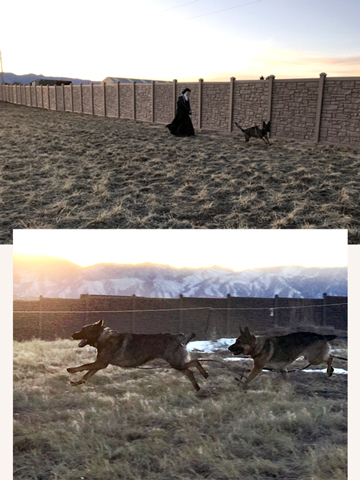 At the end of each day, we would also take Zelie and Meika for a romp across the large field that is now part of the enclosure – so much more space to run! Little Meika flies! Soon, therefore, we will face the rather daunting task of moving! 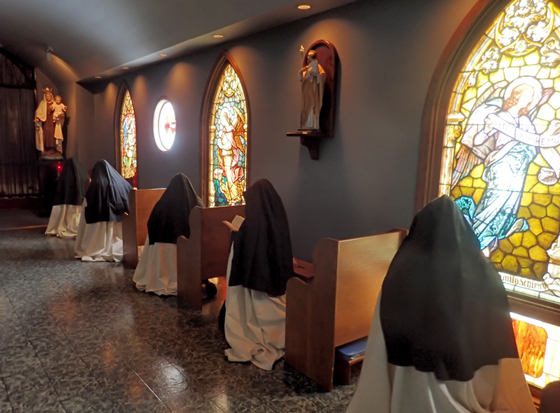 The life of Carmel sometimes can become rather sedentary, especially in winter, but we imagine we will all be in better shape at the end of this Lent! Packing boxes, walking them across the yard, unpacking and re-packing… Let us hope for some warm weather for “the great migration”! At recreation the other day, Our Mother suggested that we name the new building, since we don’t want to keep calling it “the modular” forever! Many ideas were tossed around, but one finalist is Loreto. We’re thinking it might be a perfect name for our workrooms: the name of the house of the Holy Family. 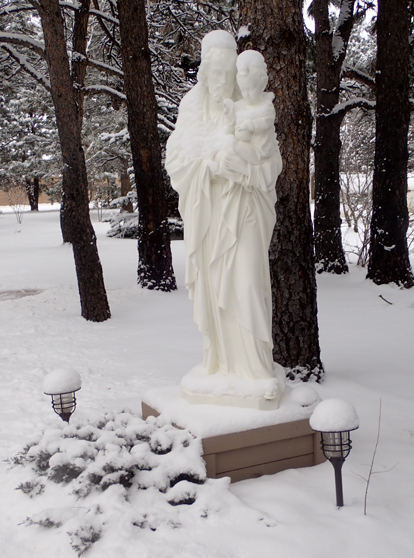 We hope to imitate Jesus, Mary and Joseph in their quiet, faithful fulfillment of daily tasks. Continually in the company of this “Trinity on earth,” may we find our union with God to be more and more fruitful for souls and for the Church! However, as we go to press, another idea, “Bethany” has fast been gaining ground, the place where Our Lord came to rest and be with His friends… We will let you know which name claims the victory in the end, or if some other dark horse steals in at the last moment! And we thank you for all of your prayers and support for us during this project. We’ve redirected our efforts to a little domestic sewing during these past months. Some well-worn, thread-bare habits will now become garden/work habits – giving way to new habits for some of our Sisters. The search for suitable linen and brown habit wool kept us occupied for a good while; these fabrics are not quite “in style” these days! But over our nearly 32 years, we’ve made good friends with sewing and fabric suppliers who understand our needs. God bless them for their help! 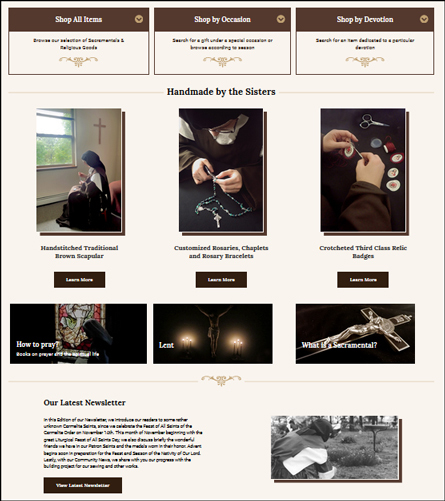 We also were running low on the good, sturdy dark brown wool for the scapulars we make. This was even more challenging, since in the past year, we have made and shipped over 8000 scapulars, including dozens of Third Order ceremonial scapulars. That number increases each year by bounds. Five huge 50-yard bolts of heavy brown wool arrived one day last month, filling half the small entry room of the Monastery. Yes, that does come to 250 yards of scapular wool! 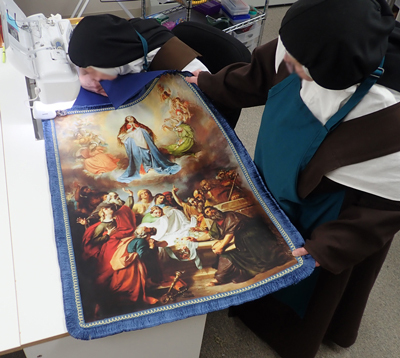 A few projects for the Church have also claimed our attention, such as the new banner for the Feast of the Assumption of Our Lady, new linens for use at the altar to replace old, worn ones, and some vestment repairs. But we know that the future holds more projects for our sewing and embroidery skills. Don’t forget March is the month dedicated to St. Joseph! As we close this letter, we are under 6 or so inches of snow (with more falling) and at exactly 1° outside (and also falling). 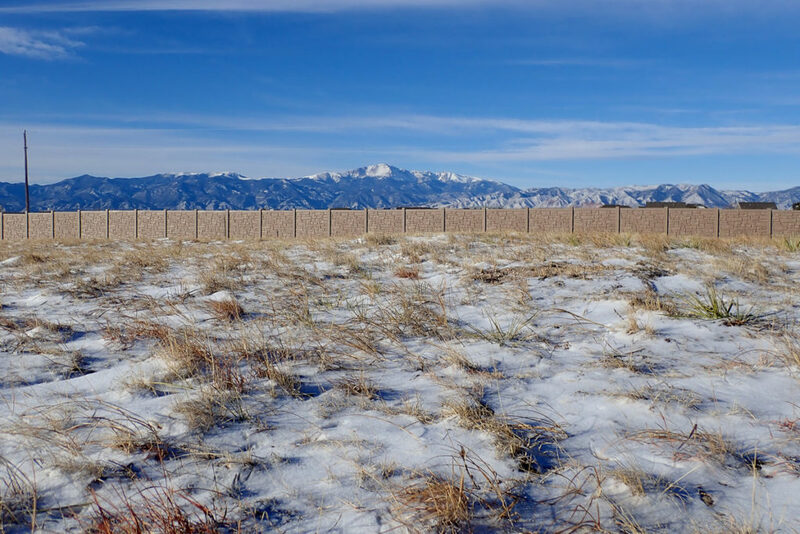 We are having a rather non-typical winter for Colorado – a few inches of snow every week or so – instead of dry, dry, dry! It sure is a help for keeping our trees and gardens well-watered. You’ll be hearing from us soon again this Lent, since we have promised to give the final announcement about the website launch. This will also give us an opportunity to offer further encouragement during this blessed season. Until then, please be assured of our prayers for the graces so needed, and so desired, for a truly holy and profitable Lenten Season.